Site-specific installation and wall drawing that highlights the areas various modes of growth and decay from my solo exhibition at the Azarian McCullough Gallery on the campus of St. Thomas Aquinas College in New York. The design took from the surrounding architecture to showcase how the built past fits into today's vision and the areas imagined futures. By providing a remembered history the installation was suspended in time between construction and demolition, evolution and decay. 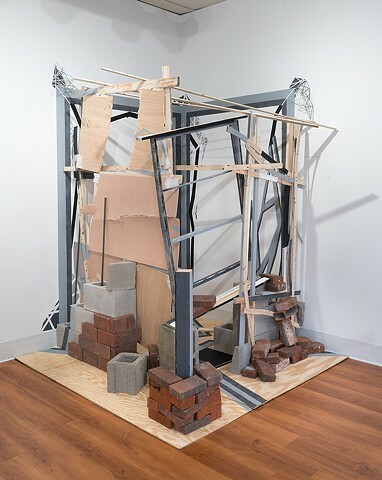 The installation was constructed on site in about three days and incorporated elements not only from the campus structures and the areas vernacular nature, but also from paintings being exhibited and the gallery layout. It included an 8 foot cubic dimension with wall drawings and a wood, concrete, clay and plaster assemblage.